There are two fluffy cat towers, one called the Death Star, the other the Jedi temple. One has a grey cat nosing around like a feline PI. The cat’s named Deckard (the hero from Bladerunner) and he is one of 15 cats living upstairs at Catmosphere, Sydney’s first cat cafe. At Catmosphere Sydney the cafe is separate to the cat experience. People can spend an hour with the cats upstairs and then descend to have coffee and a meal. The cat room is $20; with that you get a coffee (lidded to prevent rogue cat sips), a biscuit and an hour’s access to one of two cat rooms. 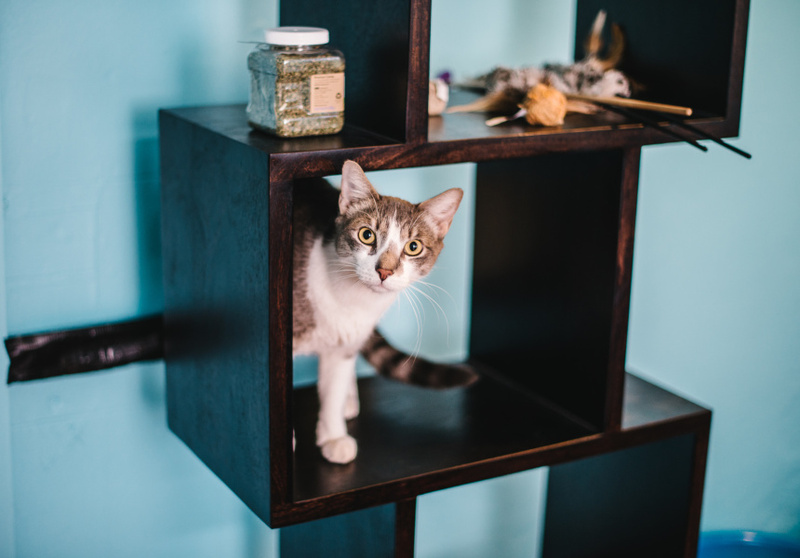 The downstairs room has just five cats and serves as an introductory experience for both humans and cats before they climb the stairs to meet the cafe’s 15 main attractions. To ensure maximum cat comfort and human-to-cat bonding each room never exceeds a 1:1 cat-to-human ratio. Those who’ve been dragged by cat-loving friends can still enjoy roast pork and sesame mayonnaise sandwiches on Luxe brioche; homemade Moroccan lamb, vegetable and barley soup; and free wi-fi in the cafe’s courtyard. Catmosphere employs a cat-adoption program in collaboration with the World League Protection of Animals (WLPA). All of Catmosphere’s cats are rescue cats from the WLPA.